CorelDRAW is among the best of the vector drawing applications. It’s considerably easier to master than Adobe Illustrator, and it comes in a cooler box. It is, however, grotesquely expensive. The full X5 package – that’s version 15, if you’ve been keeping score – has a street price of about three hundred dollars. Capable though it may be, CorelDRAW has long been priced out of reach for most non-professional users. 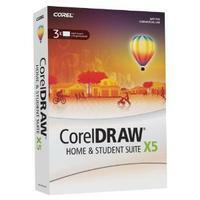 The CorelDRAW Home and Student Suite X5 package is CorelDRAW without the traditional credit card outrage that has long attended this software. It has a street price somewhere south of eighty dollars. Costing less than a tank of gasoline – admittedly, that would be our hugely overpriced Canadian gasoline, with about half the bill consisting of various taxes – this incarnation of CorelDRAW should be accessible to pretty much anyone. It probably need not be mentioned that CorelDRAW Home and Student Suite X5 is a somewhat lightened version of the full commercial CorelDRAW X5 package, hence its more affordable nature. Remarkably, the lightening that’s been applied to it hasn’t really affected its core functionality. Most of the branches that got pruned for the Home and Student Suite weren’t growing anything useful. In fact, determining exactly what’s been excised from the Home and Student release of CorelDRAW X5 is something of an undertaking. I wasn’t even able to locate a page at CorelDRAW’s web site for this edition. Calling Corel’s support line wasn’t all that productive either – the staff member I spoke to described CorelDRAW Home and Student Suite X5 as having been “neutered,” but he wasn’t able to detail the surgery that had been performed upon it. ”The Home & Student Suite X5 does not include VBA / VSTA or Macro support.” This refers to the internal Visual BASIC support, Microsoft’s Visual Studio for Applications support and the macro processor of the full commercial edition. Unless you intend to write programs to create graphics, this arguably isn’t a deal breaker. ”Some more advanced features a professional user would need are not available (such as PrePress, PreFlight or enhanced color management options).” These features are useful if you’re creating art to be reproduced through commercial lithography. Check your basement – should you fail to notice a printing press down there, you probably won’t miss these items. ”Does not include Swish mini max.” This turned out to be animation software, which both has nothing much to do with what CorelDRAW is typically bought to perform – this being some species of drawing – and which has a learning curve comparable to that of a medium-size particle accelerator. ”The contents have also been reduced (1300 high-quality cliparts and 140 fonts).” This refers to the clip art and fonts traditionally bundled with CorelDRAW since the dawn of time. This is arguably the aspect of CorelDRAW least likely to be missed. While CorelDRAW’s library of royalty-free art was something of a thrill back in the twentieth century, it seems seriously dusty and threadbare in the new millennium. You can download terabytes of better graphics and fonts from free archives around the net, or buy inexpensive subject-specific stock drawings and photographs from repositories such as iStockPhoto and Shutterstock. ”The printed hard-cover book from Graphics Suite is not included (it is included in electronic format).” Since its inception during the late middle ages, CorelDRAW has come with one or more printed manuals. Masterworks of impenetrably bad organization, achingly unreadable text and questionable design, they may have helped justify the cost of the product, but they were rarely read. Provided with CorelDRAW Home and Student Suite X5 as a searchable help file rather than a book, the product documentation is vastly more useable. The most notable limitation of the CorelDRAW Home and Student Suite X5 is that its license stipulates that it not be installed for use in a business or other professional environment. It’s unclear how Corel would know if its trusting nature has been abused in this regard, of course. Each license allows for up to three installations per family. CorelDRAW is a mature and largely well thought-out drawing application. It embodies a rich palette of tools that stretch the envelope of what can be accomplished with vector drawing. It supports a variety of color models, including RGB and CMYK color and Pantone and Focoltone process color matching, among others. It will import and export its graphics to pretty much any format you’re likely to encounter. Unlike earlier editions of CorelDRAW, this one comes with a number of specialized tools. There’s a tool for drawing spirals, for example – something that was pretty tricky in earlier epochs – and two tools to create stars. There’s a tool to draw dimension lines for mechanical drawings. The drop shadow tool will create convincing shadows behind any object. The transparency tool can add variable transparency to things. The tool bar structure of CorelDRAW will let you access or ignore these things, as you see fit – it’s good at keeping its specialized features out of your face when you don’t require them. You can apply a number of features of CorelDRAW X5 to the task of managing objects – one of CorelDRAW’s traditional strengths. Aside from grouping and combining objects, it allows for welding and trimming them, to extract portions of complex objects without having to manually draw in some of their elements. This is immensely powerful – and if it sounded a bit like two Martians reviewing their plans to invade Earth, it will probably begin to explain one of the fundamental issues surrounding CorelDRAW. The software has the learning curve of the CERN supercollider. If you’re already up to speed with CorelDRAW – perhaps from a protracted encounter with one of its earlier forebears – you’ll probably find the X5 package to be a cheap date. It’s intuitively laid out, easy to follow and most of it makes sense without the need to crack its manual. This said, if the closest you’ve come to a serious drawing application thus far has been Windows Paint, you’ll want to select a specific portion of your wall to bang your head against, to limit the overall structural damage to your digs. Learning CorelDRAW X5 from a standing start is somewhat brutal. The power of CorelDRAW is that it thinks like a commercial graphic artist, and it will immediately make sense to anyone with a background in lithography, prepress, publishing, design or other species of commercial graphics. If your paper cuts don’t bleed non-repro blue, however, it will probably take you ages before you have CorelDRAW right where it wants you. CorelDRAW X5’s documentation is impressively extensive, but it presumes that anyone reading it will have at least a rudimentary idea of what they’re up to, and what they wish to accomplish. It’s anorexically thin on tutorials and exercises to help you get up to speed. For example, there’s a reasonably comprehensible discussion of drawing lines with the Bézier tool… but you’ll be clicking around the Help window for some long while to ascertain what the Bézier tool does, and why you’d want to use it. I should note that in an earlier life, I made a fair pile of cash writing third-party books about CorelDRAW. I’ll admit to a faint sense of hypocrisy flaming its impenetrable documentation now when its shortcomings paid for several exotic cars and a really nice garage to park them in back in the day. The “bottom line” for the CorelDRAW Home and Student Suite X5 is that you should probably be prepared to spend a few weeks with it before you begin to see useful results from the software. It does come with some “training” tools – there are, for example, videos on the install CD-ROM – but these serve more as introductions to the capabilities of the software than genuine instruction. It’s capable of fantastic work – don’t be too disappointed if it doesn’t seem particularly fantastic right out of the box. In addition to CorelDRAW itself, the CorelDRAW Home and Student Suite X5 includes several ancillary applications, the most notable of which is CorelPAINT. A sophisticated raster image editing package, it’s comparable to Adobe Photoshop in many respects. It, too, has a beast of a learning curve, but it’s capable of some exemplary work once you finally have it surrounded. The CorelDRAW Home and Student Suite X5 package is an excellent value for anyone who needs powerful commercial drawing software without the need to sell any essential body parts to pay for it. Once you align your mind with its world view, it’s a treat to use. Despite its name, it hasn’t been crippled in any meaningful sense, something of a rarity for entry-level editions of large applications. The height of the wall you’ll need to climb over to reach its potential, however, should not be underestimated. I agree the limitations of this edition are of little consequence to home users. Corel did not do such a good job removing these pro features from the Home and Student package. On first using the CorelPaint application it notified me it was unable to initialize Visual Basic – i.e. Visual Basic hadn’t been removed with any great care. The installation still had empty folders for Visual Basic and Visual Studio in it’s documentation directories. None the less it still loads my Version 12 drawings and that backward compatibility is important. Very good value – I’m very pleased. I was finding limited information about the differences in the Home edition of CorelDraw! Then I found your extensive review. Not only did you answer my question, but your entertaining writing style and detailed analysis made your review fun to read. Awesome!!! Thanks so much! Thank you for this review. I can’t afford the full version and was worried that the student package wouldn’t do what I needed. I’m glad I found your review.